What a Return for Redmond! 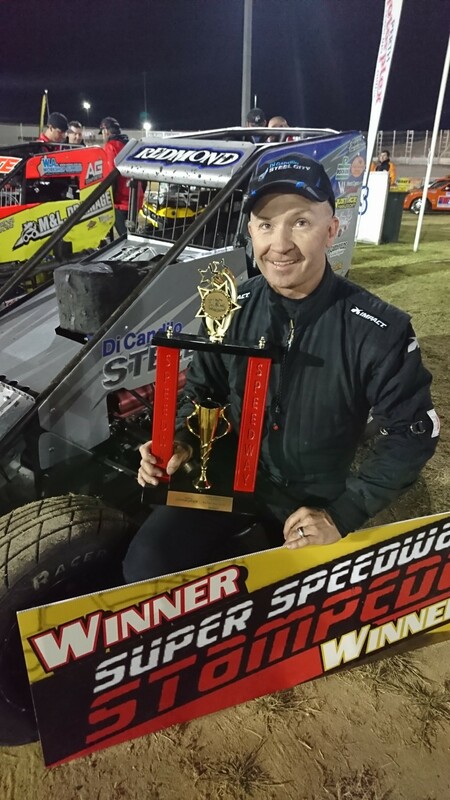 Lee Redmond has returned to The Pool Shop Group Speedcar racing in the best possible fashion, winning the twenty lap feature event at the Perth Motorplex tonight. 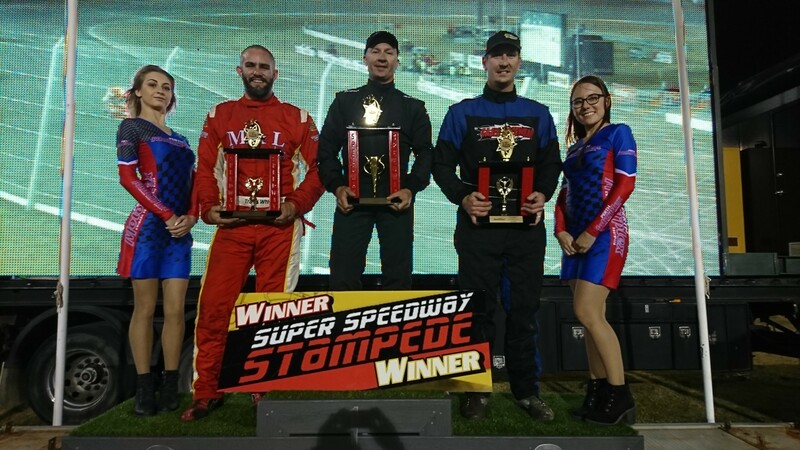 All eleven Speedcars that began the night would make it on track for the feature, with Keenan Fleming and Vaughan Manders leading the field away from the front row after the WASDA club elected to go back to the handicap style feature lineups. This meant that Dayne Kingshott would be coming from the rear along with last week’s podium getters in Travis White and Alfonso Guadagnino. As the race went green it was Keenan Fleming who found himself in the lead once again, an effort he had made all throughout the night in the heats but was unable to hold until races end, something he was determined to rectify in the feature. Kingshott meanwhile was on a charge, grabbing third from Lee Redmond in a very close move, then he pulled a slidejob on Manders for second in turn four, the two coming together, seeing Kingshott sideways, straighten up and Manders come to a stop. This would set up a restart with two laps complete, Kingshott coming from position two behind Fleming while Manders would be sent to the rear for the restart. Kingshott didn’t need a second chance on the restart, grabbing the lead and racing away as Redmond fought his way into second past Fleming. Two laps later Fleming would slow once again and head infield, allowing Travis White to move into third ahead of Glen Mears, the top four spread out across the track. The battle for fifth onwards was a close one, five cars battling it out, with Rob Golding just getting the lead on Guadagnino, Manders, Steven Doyle and Steven Henderson after some maneuvering between the group. Back up front and Kingshott was in lapped traffic by lap eleven, allowing Redmond to significantly close the gap and begin to look for a way through. On lap thirteen Redmond was right on Kingshott’s tail, then just as Redmond dove underneath to take the lead, Kingshott slowed and headed straight to the infield. This left Redmond leading White and Mears, but Redmond was now half a lap ahead of the next two cars. In fact, Redmond was so far ahead that he lapped fifth place and was right on fourth placed Guadagnino’s tail as he crossed the line to take the chequered flag. The win would be Redmond’s fifth career win at the Motorplex and his third in Speedcars, defeating second placed White by over nine seconds, while Glen Mears came home third. Giadagnino would be the last car on the lead lap, followed by Golding, Manders, Henderson, Steve Doyle and Beau Doyle who did a great job in his first ever Speedcar meeting. There will now be a few weeks break for the Pool Shop Group Speedcars, who will return to the Perth Motorplex on the 24th of November. Heat One, 8 laps: 1. 24 Dayne Kingshott, 2. 9 Vaughan Manders, 3. 16 Alfonso Guadagnino, 4. 23 Glen Mears, 5. 38 Travis White, 6. 52 Lee Redmond, 7. 19 Steven Henderson, 8. Beau Doyle. DNF: 26 Keenan Fleming (5), 75 Steve Doyle (4), 15 Rob Golding (4). Total Time: 2.18.514. Winning Margin: 3.141. Fastest Lap: 17.087 Dayne Kingshott. Heat Two (Indian File), 6 laps: 1. 24 Dayne Kingshott, 2. 23 Glen Mears, 3. 9 Vaughan Manders, 4. 75 Steve Doyle, 5. 52 Lee Redmond, 6. 16 Alfonso Guadagnino, 7. 51 Beau Doyle, 8. 15 Rob Golding. DNF: 19 Steven Henderson (0). DNS: 38 Travis White. Total Time: No Time. Winning Margin: Declared. Fastest Lap: 16.425 Dayne Kingshott. Feature, 20 laps: 1. 52 Lee Redmond, 2. 38 Travis White, 3. 23 Glen Mears, 4. 16 Alfonso Guadagnino, 5. 15 Rob Golding (19), 6. 9 Vaughan Manders (19), 7. 19 Steven Henderson (19), 8. 75 Steve Doyle (19), 9. 51 Beau Doyle (18). DNF: 24 Dayne Kingshott (13), 26 Keenan Fleming (5). Total Time: No Time. Winning Margin: 9.053. Fastest Lap: 16.478 Dayne Kingshott.